This just in: driving a car costs a whole bunch of money. Crazy as it may sound to all eight of our car-loving readers, puttin’ the pedal to the metal isn’t quite as cost effective as actually pedaling. This according the American Public Transportation Association’s Transit Savings Report. They looked at what a car costs to own and run (the whole deal from buying it, maintaining it, parking, registration, insurance and more) and then compared that with what transit use would cost the same family. The PI says in Seattle such a comparison nets a$10,483 savings for those chucking their car keys. And that’s for transit use. 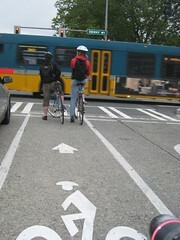 A bicycle switchover would probably fare even better. Pretty impressive. When we started this blog (and it pains me to admit this) we had three cars. We’re now down to one (does that mean we are $21k ahead? ), primarily used for skiing and camping trips. Our costs are way low (since we hardly drive, never park and aren’t super concerned about depreciation since these kooky VW Campers still sell for what they went for new) essentially adding up to insurance and gas and limited maintenance. We’ve done the math and even if we could get a hold of a conveniently located rental car, or if Zip Car came with enough miles for a weekend of skiing, it’s remains cheaper to keep what we have. Even still, we feel dirty owning a car. I hate driving and hate being part of such a broken system. So reports like this tempt me and keep me looking at options. Who knows, maybe Zip Car will come out with a “go camping” or “Sunday Drive” option where you pay a bit more for a bit more miles (in fact, I just emailed them the suggestion). Anyone have any other options for us (and don’t say quit skiing)? While news like this could entice many to bail on car ownership, it seems like government is trying to keep us chained to the auto industry, using promises of a $4500 stipend for turning in a gas guzzler and replacing it with a newer, slightly more economical model. Cutely titled “Cash for Clunkers” the plan appeared under the banner of climate change but doesn’t strike me as anything other than a politically beige way send additional cash to the auto industry. As I tweeted yesterday, how come only new car buyers are getting the bonus? If this is about fixing the climate, then shouldn’t non-drivers be eligible for the same (more!)? Isn’t going from 18mpg to unlimted mpg better than the 28mpg called for by the trade-in proposal? Tolerance in the PI House? In other breaking news, only a dozen bike/transit trolls had posted comments to the PI Transit Savings article by 10pm, causing me to wonder if the single occupancy drivers are finally running out gas. Could it mean a new level of tolerance will allow meaningful, rational discussion of these important issues? Is such a breakthrough possible? I’m not sure, but tonight I go to bed hopeful. This entry was posted in bicycle neglect, bigger than here, bikes, Human Powered Politics, mass transit, sustainability and tagged alternative, bike life, bikes, economy, money, transit. Bookmark the permalink. Interesting! We were actually going to go down to no cars, but now we’re starting to wonder. We’re only about a year away from having the Soob paid off, and it’s occurred to both of us that having a 5 y.o. Forester, paid off, with 44k miles on it would be like having our own private plane for, camping farther than we can bike, disc golf tourneys, going to NYC, etc. But then we think about how awesome it was living in SF and NY and just not owning one at all. We’ve had the thing listed on craiglist for a year, but not at any kind of a bargain because we’re not super serious about dumping it. And “more of the same from DC”? We’re workin’ on it! We’ve seen an increase in cargo bikes, and Rebbie worked with some local advocacy folks to set up a bike clinic booth at the farmers’ market she runs in Mt. Pleasant. Oh, and the Obamas have a veggie garden at the White House. That’s kinda Hopey and Changeriffic, ain’t it? Pingback: Streetsblog » Why Won’t the Feds Encourage People to Go Car-Free? The thing that boggles my mind, is how much money state and federal governments would save if less people drove and more people rode bikes, and yet they’re still dumping money into the automobile system. I think it was Scotland that recently did a study and determined their economy could benefit on the order of 4 billion pounds per year if they raised their cycling rate up to 15-20% of all trips. Note that when people calculate how much cars cost, they tend to start with brand new cars and assume that they don’t last very long. Five years? 60,000 miles? Come on. If you take good care of your car, it should last 15 years, 200,000 miles. Or buy it used, and get another 100,000 miles out of it — but pay 75% off up front. They’re still expensive, but not quite as bad as people make it sound. It does work as an escape (with fridge, water tank, stove and food storage) — not something to take lightly in a fault-zone laden region due for the “big one.” Still we feel the tug of completely car-free life. And no-offense to the “more of the same” — it certainly wasn’t aimed at the likes of you and folks making the change from the ground up. I’m just a bit weary of the continued Detroit love and would like to see the same money spent in a slightly more enlightened fashion. I think people are slowly becoming aware of the costs of car ownership, especially with gas prices last summer. However, the main argument I hear is for convenience and time savings that the car offers. We all know that 60%+ of car trips are 4 miles or less, yet what are these trips for? Groceries? Dry cleaning? Picking up kids from school/practice/etc.? Dave — you are right. Even though the facts are out there, we still keep funding the same old same old. The system is broken. Do you think influence and money have something to do with business is usual? Lawrence Lessig and his Change Congress movement would probably agree. 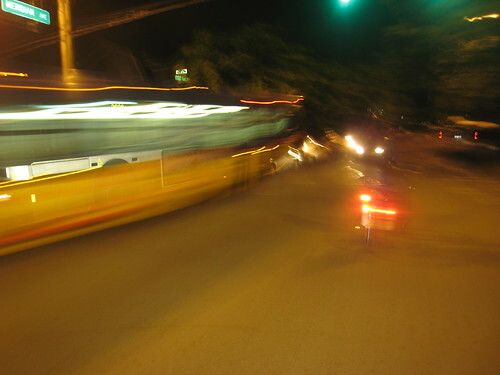 @Layne: we can give them our experience – riding in Portland, I average very nearly the same speed as cars on a lot of my trips, because they have to stop at all the same stops I do, and often the speed limits are around 20mph (with small streets or speed bumps or roundabouts encouraging slower speeds). I have a type of bike which can carry quite a lot, and I can get several days worth of groceries for two people home on it, including liquids, glass bottles, etc. Sometimes my wife meets me at the store after work, she in the car and me on my bike, and traveling home from there, usually arrives no more than a few minutes ahead of me, and the whole way is uphill from the store. I am not an athletic rider at all, by the way. I have no aspirations to ride fast, or to beat anyone anywhere. A reader of Portlandize from LA mentioned that his car has a computer which shows the average speed of his trips from start to finish, and most of his in-town trips average between 10-15 mph. Not to mention, my bike cost $550, I’ve put a couple hundred into upgrades, and I spend probably $50/yr on required maintenance. No insurance cost, no fuel cost. That’s riding about 2,500 miles per year (very rough estimate), for about 95% of all my trips anywhere. I think what people need to realize, is that not all bikes are meant for sport. In fact, most bikes in the world are meant for exactly the types of trips they use their cars for (look at the Netherlands, Denmark, China, etc). @Tim K: Yeah, I think companies with their financial mits in politics have a whole lot to do with our continued insistence on promoting massive automobile use. Layne — we’ve been trying to tackle those excuses here at Car Free Days for the last year and a half. We’ve been trying to show via example that a family of four really can get most of their errands done via bike — and not just muddle through the errands, we actually prefer to shop, haul kids to play dates, pick up trailer hitches, etc, via bike. Big loads? No problem. And Doug, I understand your point, but still a LOT of people buy new cars often.I think my neighbors are a reasonably frugal bunch but we have the oldest cars on the block. I also think that if this “math” is tilted a little toward showing the high cost of car ownership that’s fine — because there’s so much of car 0wnership (road subsidies, pollution, death toll from crashes, etc) that isn’t captured anywhere. Dave – Great comments (and great examples in your own life!). Keep it up. We’ll get there! @Dave I agree. 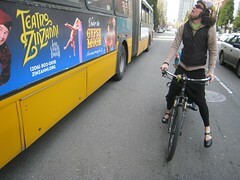 I lived in Portland in 2001-2005, and I went everywhere by bike (or MAX or bus). I found it to be extremely easy to get everything I needed by bike or foot. Now I live in Chicago, and find the same situation. I have bike baskets, and my SO and I can get all of our groceries by bike if we want. Transit times by bike within PDX or Chicago have been comparable to or better than by car. The problem is in convincing people of this, especially people with kids. (Something I have zero experience with.) The average trip of four miles seems like a trek to Mongolia for most people before they actually try it. (My SO was shocked that we had biked 12 miles the other day.) That mental block is one hurdle to clear. Also, the situation in Portland is a lot different than the situation in Hillsboro just as the situation is a lot different in Schaumburg than in the city of Chicago. Biking is more difficult in the suburbs (due to lack of density, zoning, lack of safe bike routes, etc.) than in the city. I don’t mean to derail the conversation. I think that people are starting realize intuitively that driving is a huge waste of cash, but they don’t see any alternative. I agree with you that the best way to offer an alternative is to offer your positive experiences living by bike. @Dave – I forgot to say an emphatic “YES!” to your point that not all bikes are for sport. I’m so locked into biking as commuting that I forget that most people see it as a sport, not as a transportation option. One of my favorite things to see is the innovative ways people use bikes to carry cargo. @Tim K – Glad to hear that you and your family have had success with biking! Love your pictures of bikes carrying stuff by trailer. @Layne: Yeah, suburbs are a whole different matter – I think people are starting to see that the way we’ve designed them, they aren’t even very livable with cars (or they’re very expensive to live in because you have to use your car so much). One thing that I think can help in these instances is things like electric assists for bicycles. Things like the Stokemonkey, designed by Todd of Clever Cycles in Portland (http://www.flickr.com/photos/cleverchimp/3349677821/), can help a normal, everyday person travel long distances with heavy loads, with a very very minimal energy usage (especially as compared with a car). I think it makes sense to me to re-zone and retrofit suburbs to be more like small cities in and of themselves, designed similarly to how Portland, Chicago, and other cities themselves are (connected streets, denser development, etc), but if you have to travel in suburbs the way they are, there are solutions that can make it much better for you. …we actually prefer to shop, haul kids to play dates, pick up trailer hitches, etc, via bike. Big loads? No problem. We’ve been doing the same, and I must admit that I felt some pride on those 17 degree days that the girl got on the bike and we didn’t bag out (right up until I’d get to work and see an entry from a MPLS bike blogger, showing off their awesome balaclava icicle forest, that’s humbling). The thing that gets the wife and I is when someone says to us, “You guys are amazing!” or “You’re my heroes!” or something along those lines. We’re not amazing, there’s nothing that extraordinary about our choice to bike instead of drive, other than we’ve grown accustomed to it and we like it. And that’s the thing: if there’s a message we want to send by example, it’s something more like, “this isn’t hard and it’s not extraordinary, it’s pretty fun and if you want to do this you totally can.” So when someone does the whole breathless admiration thing, it kinda feels like we failed to get the message across, and that they’re putting us on a pedestal to justify their belief that it’s not something that they could ever do. Y’ever get that? Do you know what I mean? How do you respond to it? Even if you don’t get reduce the number of cars you own, you still save a lot of money by biking as much as you can. Plus, your health improves and it’s a lot of fun! I haven’t had many people talk to me about it, but I’ve gotten some interesting looks carrying certain things on my bike, that you usually don’t see strapped to a “normal” bike. I agree with all that’s been said about there not really being anything remarkable or inspiring about making most of your trips by bicycle, and that the example I want to present personally as well, is that (nearly) anyone can do it. I think this is also one of the main reasons that helmets and lycra and giant reflective vests and all that kind of thing are a deterrent to more people cycling – if everyone you see on a bike is wearing a helmet and a lycra suit, you’re definitely not going to get the idea that riding a bike is for everyone. In the end, I think just being as normal and human as possible is the best way to show people that they can do what you’re doing. The more normal and human you are, the more they will relate to you. The more prepared for danger or athletic you look, the more they’ll feel like that’s something “those” people do. Ugh the worst part of the $4,500 for purchasing a new car…is it totally disregards how much pollution is caused in the production of a new car… Read Asphalt Nation if you want to know more. Chiggins and Dave — yep, we get that all the time and feel exactly the same way. Our big worry is that if some people think we come across that way (hero worship) then are others thinking we are self riotous ? That’s the last thing we want. Our approach is to encourage and tell people to give it a try at a level they are comfortable with. Maybe they’ll find it’s not so hard (and even enjoyable). That’s how the “conversion” worked for us. Anne gets this a lot w/ parents at school as part of her bike to work program — and thankfully she’s a little more smooth than I am. And Deb — yup, I’m with you. And don’t get me started hybrids … all those batteries and battery byproducts. As I mentioned in the Twitter reply… Americans like to think we can shop our way out of anything. Climate problems? Let’s buy a new car! If they gotta shop, how about buying a new bicycle instead? Anyone building bikes Cradle-to-Cradle these days? The big issues with bikes in most parts of the country is that no one ever really considered a car-free society when they built house or paved roads. I am only 7 miles from work, but the roads on the way there are hilly, have no shoulders or bike lanes and are filled with twists and turns that make biking really dangerous. A few people have taken these routes via bike, I see them sometimes on my way home or to work, but I can’t do that with my toddler in tow. We also don’t have a bus stop near our home. I guess they assumed people living in this neighborhood would not need to ride a bus to work, or maybe it is because the place where I am living now only a decade ago was a farm. Actually, when they originally built the houses and roads in many cities in the US, cars didn’t exist. We simply made a huge national project of creating infrastructure for cars once they did exist, at the expense of all other modes of transportation. In Lithuania, there were buses all over the place to way out in the middle of farm pastures and fields of nothing. In Germany, I remember getting off of a train literally in a cow pasture with nothing else around. The kind of infrastructure that only supports personal automobiles is, as you noted, rather prejudicial – it makes any kind of transportation very difficult for certain groups in society. I’ve been thinking about this post and I have one thought to add. I think that the idea that bikes are cheaper than cars is a good one. However, I’m not sure that should be the ulitmate tag line. I live in a fairly well to do town. People here are driving luxury SUVs etc and the price differential isn’t going to really make a difference for them. Also most people around here would not give up their car. Myself included, my Jetta is paid off and I’ll keep that thing until it dies. I do need it as viable pub transportation is often a PITA and needs much work. So I’m thinking for the subset of people I live near- this argument isn’t going to make them do anything different. And perhaps can give them an- eh only poor (er) people need bikes. I have my Lexus and that works great for me. I’m thinking of a preschool mom I know who has big bucks, she just did a reno of her new victorian house all while living in their other huge house down the block. they put in Geothermal heating and cooling. Def not b/c it will end up cheaper ( in the long run) but probably b/c it was 1. cool ( I’m guessing) and 2. effiecient and earth centric. I am not sure of my point. But I guess I’m thinking that in trying to get my neighbors to embrace biking, expense is not going to play a role in it. B/c people will maintain their cars and also have to choose to bike. For that subset, I’m hoping to just show it’s easy. And I also need to deflect nicely the pedestal comments as the commenter was right- it distances them from the ability of biking which is so easy and quite frankly fun.